Located about 15 miles east of the town of Comptche, on a hard-packed gravel road. It can also be reached over 13 miles of paved road by traveling west from Ukiah past Orr's Mineral Hot Springs resort. Head to the heart of the Coast Range and step into the majesty of Montgomery Woods State Natural Reserve. You’ll find a world rich in solitude, silence, and remarkable groves of coast redwoods. A 367.5-foot redwood at Montgomery Woods was once thought to be the tallest tree in the world. 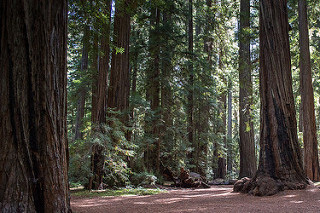 Taller trees have since been found in Humboldt Redwoods State Park and Redwoods National Park, but Montgomery Woods is still noted for its lofty giants. A two-mile-long loop trail leads, steeply at first, on a rewarding tour. A nine-acre donation by Robert Orr in 1945 started the reserve, which has been enlarged to 2,743 acres by purchases and donations from Save the Redwoods League. The reserve is open for day use only—no camping allowed. The two-mile-long Montgomery Trail takes an hour or two to hike. Its steep 0.3-mile start and finish has about a 200-foot elevation gain. In wet weather, the trail can be muddy or flooded. 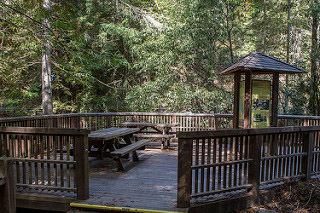 Nice picnic sites lie near the parking area and along the trail. No visitor center or camping. If you have an hour, hike the steep grade one-third mile up on the Montgomery Trail to the majestic Kellieowen Grove. Picnic beside the Montgomery Creek. If you have half a day, hike the entire two miles of Montgomery Trail to see the creek, the lush fern forests, and many groves of awe-inspiring redwoods. The restroom, interpretive panels, and shaded picnic tables at the park entrance are accessible. The beginning of the natural reserve’s unpaved trail may be too steep for many wheelchair users. Accessibility in parks is continually improving. For updates, click the Accessible Features link at the top right of this page. Montgomery Woods lies 32 miles southeast of Mendocino or 13 miles northwest of Ukiah on twisty Orr Springs Road, past Orr's Mineral Hot Springs resort. The Reserve is located about 15 miles east of the town of Comptche. The weather can be changeable. Summer temperatures can reach the high 80s in July, while in winter, they can dip below 40 degrees. Rain often falls between November and April. The reserve and its natural and cultural resources are protected by state law and may not be disturbed. Except for service animals, pets are not permitted on the trail or in the reserve. Stay on the trail to avoid poison oak and to protect vegetation. The center of the reserve contains a marshy flat, which attracts mosquitoes. The two-mile-long Montgomery Trail takes an hour or two to hike. Its steep 0.3-mile start and finish has about a 200-foot elevation gain. In wet weather, the trail can be muddy or flooded. Nice picnic sites lie near the parking area and along the trail. There is no visitor center, and camping is not allowed. If you have an hour, hike one-third mile (on a steep incline) on the Montgomery Trail to the majestic Kellieowen Grove. Picnic beside the Montgomery Creek.